Mountain Dew 12 oz Cans. Mtn Dew 12 oz Cans come in 12 packs. 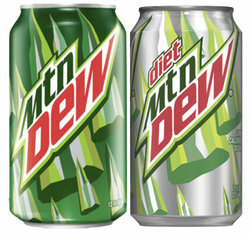 Free Mtn Dew Delivery to workplaces in Atlanta, or available for shipping nationwide. Enjoy!! 12 Pack of 12 oz Cans - Choose Type and QTY Below.